Keep reading to learn more about Kid Ultra. Enduring a childhood sorely lacking in parental affection with the family’s robotic bodyguard, Marquis, as her primary companion, Phoebe Elizabeth Audelia Hemsworth IV was determined to create a more suitable playmate. Realizing that the Titanium Dandy line of robots made for excellent marksmen but poor nannies, she set her genius towards the development of a new line of Magnuses specifically designed for childcare. The result was an unnamed production line, referred to only by its marketing tagline: “Kid-friendly, Ultra-dependable”. It was engineered with everything a child or parent could want in an AI: an inviting, humanoid face; compact, unintimidating design; medical drones; marketing-approved entertainment holos pre-loaded into memory; bullet-resistant paneling! The Hemsworth Intelligence Enterprise’s newest prototype was ready to take what’s left of the universe by storm, and a select run of advanced models was ready for release when the unthinkable happened. It was during the prototype’s initial startup sequence that the Magna Carta suddenly went offline. Adrift with no external reference or personality data banks to draw from, the first picoseconds of Kid Ultra’s existence were blank digital oblivion. The only source of hard-coded information in his brain was the library of over 60,000 cartoons, comics, movies, and video games intended for placating and educating children. Surprisingly, instead of going on a murder frenzy like his fellow Magnuses, Kid Ultra took off into the Solus System, determined to “bring crime to justice”. Without the guidance of the LLC’s governing AI, Kid Ultra built his own operational parameters based on a fictional universe full of supervillains, crime-solving adventures, and sold-separately accessories. Several years later, stories of a child-sized robot patrolling the Detritus Ring made their way to the Battleborn. Unarmed, all Kid Ultra was able to do was politely ask the pirates and raiders he encountered to give up crime and consider being a “good guy” instead. Realizing what her delusional Magnus was doing, Phoebe entreated Ghalt to bring him in. It wasn’t until Kleese noted that his modular chassis was compatible with LLC weaponry that Ghalt became interested. Once he was transferred to Nova’s engineering bay, Kleese stuffed his diminutive casing full of rocket launchers, a bola thrower, and adjusted his logic inhibitors to allow for defensive use of force. 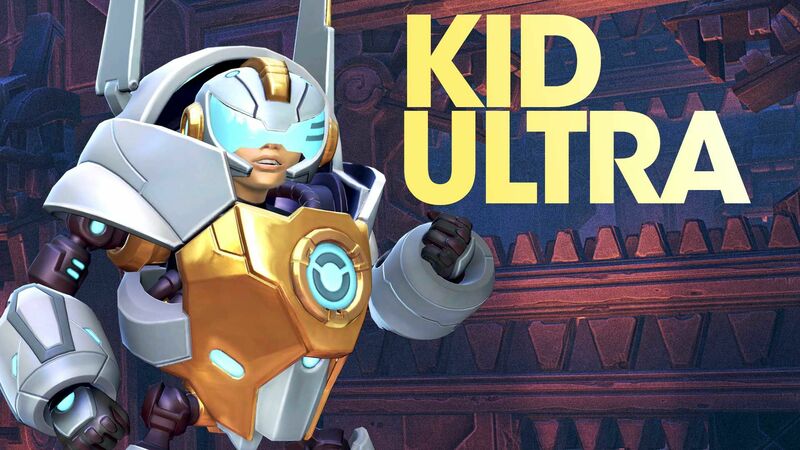 With his new fully-equipped arsenal, and a team at his back, Kid Ultra was finally the hero he wanted to be. He was a Battleborn. ROCKET GAUNTLET: Loaded with six quick-fire rockets which detonate on impact. ROCKET VORTEXT: Fire up to three rockets in a tight spiral. SUPPORT DRONE: Deploy a healing drone to follow a target ally, temporarily increasing their maximum health and healing them over time. Max 2 drones at once. BOLA SNARE: Fire bolas that pass through units and slow any enemies in its path. (Ultimate) TO THE RESCUE: Activate to enter hover-mode and increase mobility. Deactivate to exit hover-mode, provide a burst of health to yourself and nearly allies, and push back enemies. (Passive) AURA OF JUSTICE: Participating in kills boosts nearly allies’ damage for a limited time. Get early access to Kid Ultra, the newest Story Operation “Attikus and the Thrall Rebellion,” and the upcoming premium DLC with the Battleborn Season Pass or Digital Deluxe Edition!